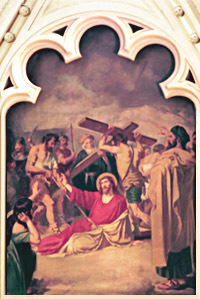 The Way of the Cross (Via Crucis), as a devotion, may be traced to Christ's journey along the Via Dolorosa itself at Jerusalem as our Lord walked—and stumbled in pain—to his crucifixion on Mount Calvary. 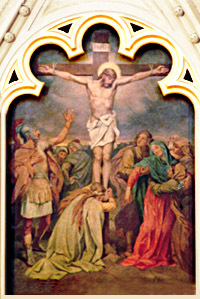 From the earliest years of the Church, pious pilgrims marked out that route to revisit for themselves the scenes of Christ's passion. 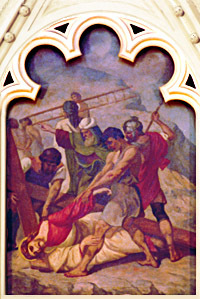 The concept of Stations, however, as halting-places along the route, with specific prayers and meditations for each incident, did not develop until the fifteenth and sixteenth centuries, especially as a result of reproductions of the holy places being set up in various parts of Europe, for the benefit of those who could not travel to Jerusalem to practice this devotion. 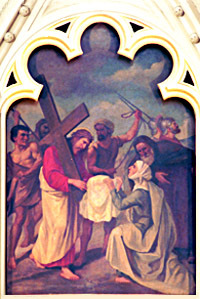 Originally, indulgences were given for making the long and dangerous journey to Jerusalem and devoutly visiting the actual scenes of Christ's Passion. But in the seventeenth century a new practice developed. 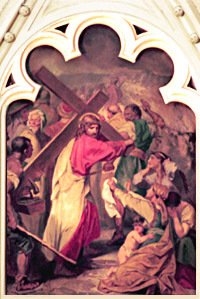 In 1686 the Franciscans received from Innocent XI the right to erect Stations in their churches; thus they, and all others affiliated to their order, could gain the same indulgences for making the Way of the Cross in their own churches as if they had made the journey to Jerusalem. In 1726 Benedict XIII extended the right to gain indulgences in these Franciscan churches to all the faithful. And in 1731 Clement XII permitted indulgenced Stations to all churches—provided they were erected by a Franciscan priest. In 1862 this last restriction was removed, to accommodate those places where no Franciscans were available. 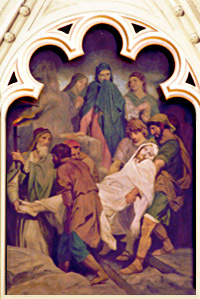 And so today the faithful are able, in their own churches, to make a pilgrimage in spirit to the central scenes of Christ's sufferings and death. 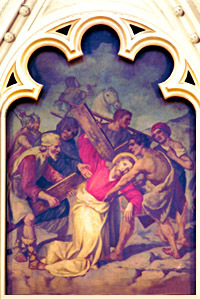 A plenary indulgence is granted for the Exercise of the Way of the Cross, provided that certain conditions are met: the stations must have been legitimately erected; fourteen crosses of real wood are required (pictures are optional); and movement must be made from one station to the next. Finally, although specific prayers and readings may be used, they are optional; all that is required is "a pious meditation on the Passion and Death of the Lord, which need not be a particular consideration of the individual mysteries of the stations" (Enchiridion of Indulgences). We therefore present these images of the Stations in Saint Francis of Assisi Church for the benefit of personal contemplation. To gain an indulgence, one would have to visit the church itself. in your glory, who are blessed throughout all ages. Amen. V. We adore You, O Lord Jesus Christ, and we bless you. The chief priests and the entire Sanhedrin kept trying to obtain false testimony against Jesus in order to put him to death, but they found none, though many false witnesses came forward. . . . The high priest rose and addressed him, "Have you no answer? What are these men testifying against you?" But Jesus was silent. Then the high priest said to him, "I order you to tell us under oath before the living God whether you are the Messiah, the Son of God." Jesus said to him in reply, "You have said so. But I tell you: From now on you will see 'the Son of Man seated at the right hand of the Power' and 'coming on the clouds of heaven.'" Then the high priest tore his robes and said, "He has blasphemed! What further need have we of witnesses? You have now heard the blasphemy; what is your opinion?" They said in reply, "He deserves to die!" Once more Pilate went out and said to them, "Look, I am bringing him out to you, so that you may know that I find no guilt in him." . . . [B]ut the Jews cried out, "If you release him, you are not a Friend of Caesar. Everyone who makes himself a king opposes Caesar." . . . And he said to the Jews, "Behold, your king!" They cried out, "Take him away, take him away! Crucify him!" 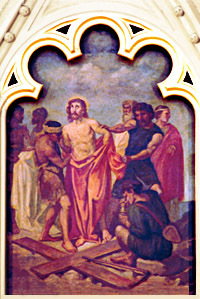 Pilate said to them, "Shall I crucify your king?" The chief priests answered, "We have no king but Caesar." 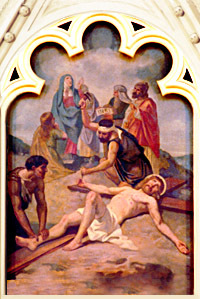 Then he handed him over to them to be crucified. 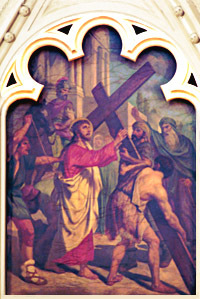 So they took Jesus, and carrying the cross himself he went out to what is called the Place of the Skull, in Hebrew, Golgotha. Who sharpen their tongues like serpents, venom of asps upon their lips. preserve me from the violent, who plot to trip me up. villains have spread a net, laid snares for me by the wayside. I say to the LORD: You are my God; listen, LORD, to the words of my prayer. 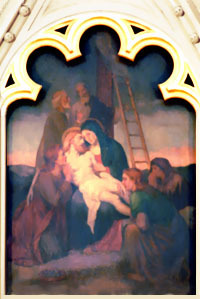 Simeon blessed them, and said to Mary his mother, "Behold, this child is destined for the fall and rise of many in Israel, and to be a sign that will be contradicted (and you yourself a sword will pierce) so that the thoughts of many hearts may be revealed." And when they had mocked him, they stripped him of the purple cloak, dressed him in his own clothes, and led him out to crucify him. 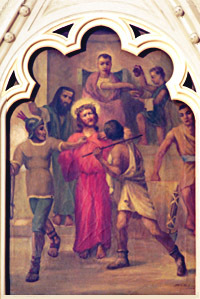 They pressed into service a passer-by, Simon, a Cyrenian, who was coming in from the country, the father of Alexander and Rufus, to carry his cross. 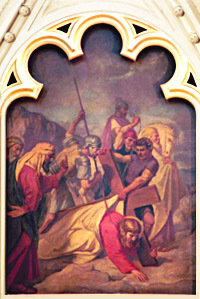 They brought him to the place of Golgotha (which is translated Place of the Skull). Then the righteous will answer him and say, "Lord, when did we see you hungry and feed you, or thirsty and give you drink? When did we see you a stranger and welcome you, or naked and clothe you? When did we see you ill or in prison, and visit you?" And the king will say to them in reply, "Amen, I say to you, whatever you did for one of these least brothers of mine, you did for me." One of those from whom men hide their faces, spurned, and we held him in no esteem. While we thought of him as stricken, as one smitten by God and afflicted. Upon him was the chastisement that makes us whole, by his stripes we were healed. 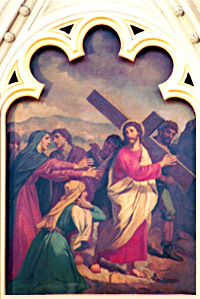 A large crowd of people followed Jesus, including many women who mourned and lamented him. Jesus turned to them and said, "Daughters of Jerusalem, do not weep for me; weep instead for yourselves and for your children, for indeed, the days are coming when people will say, 'Blessed are the barren, the wombs that never bore and the breasts that never nursed.' At that time people will say to the mountains, 'Fall upon us!' and to the hills, 'Cover us!' for if these things are done when the wood is green what will happen when it is dry?" I lie prostrate in the dust; give me life in accord with your word. I disclosed my ways and you answered me; teach me your laws. Make me understand the way of your precepts; I will ponder your wondrous deeds. I weep in bitter pain; in accord with your word to strengthen me. Though the arrogant utterly scorn me, I do not turn from your teaching. Though the snares of the wicked surround me, your teaching I do not forget. The arrogant smear me with lies, but I observe your precepts with all my heart. The arrogant have dug pits for me; defying your teaching. All your commands are steadfast. Help me! I am pursued without cause. They have almost ended my life on earth, but I do not forsake your precepts. In your kindness give me life, to keep the decrees you have spoken. The message of the cross is foolishness to those who are perishing, but to us who are being saved it is the power of God. For it is written: "I will destroy the wisdom of the wise, and the learning of the learned I will set aside." For Jews demand signs and Greeks look for wisdom, but we proclaim Christ crucified, a stumbling block to Jews and foolishness to Gentiles, but to those who are called, Jews and Greeks alike, Christ the power of God and the wisdom of God. For the foolishness of God is wiser than human wisdom, and the weakness of God is stronger than human strength. Rather, God chose the foolish of the world to shame the wise, and God chose the weak of the world to shame the strong, and God chose the lowly and despised of the world, those who count for nothing, to reduce to nothing those who are something, so that no human being might boast before God. It is due to him that you are in Christ Jesus, who became for us wisdom from God, as well as righteousness, sanctification, and redemption, so that, as it is written, "Whoever boasts, should boast in the Lord." Why so far from my call for help, from my cries of anguish? "You relied on the LORD—let him deliver you; if he loves you, let him rescue you." Did not turn away from me, but heard me when I cried out. All the families of nations will bow low before you. Save me, God, for the waters have reached my neck. I have sunk into the mire of the deep, where there is no foothold. I have gone down to the watery depths; the flood overwhelms me. I am weary with crying out; my throat is parched. More numerous than the hairs of my head are those who hate me without cause. For your sake I bear insult, shame covers my face. I looked for compassion, but there was none, for comforters, but found none. Instead they put gall in my food; for my thirst they gave me vinegar. That I may praise God's name in song and glorify it with thanksgiving. For divine anger lasts but a moment; divine favor lasts a lifetime. At dusk weeping comes for the night; but at dawn there is rejoicing.